Senior Registrar, Department of Behavioral Medicine, Sultan Qaboos University Hospital, Al-Khoud, Sultanate of Oman. *Address correspondence and reprints request to: Ahmed Bait Amer, Senior Registrar, Department of Behavioral Medicine, Sultan Qaboos University Hospital, Al-Khoud, Sultanate of Oman. This article addresses some of the groundwork of informed consent in people with mental illness whose decision-making capacity has obviously been compromised. This article examines four crucial aspects in particular, namely: i) the main elements of informed consent; ii) difficulties pertaining to psychiatric illnesses; iii) the effect of psychiatric disorders on the patient’s capability; iv) how to assess situations in which consents may not be required. Keywords: Informed consent; Adult psychiatry; Voluntarism; Competency; Psychiatric disorders; Assessment; Ethical dilemma. 1OMSB Resident (R6) Clinical Biochemistry Program; Department of Clinical Biochemistry, Sultan Qaboos University Hospital, PO Box 38, Al Khodh 123, Muscat, Sultanate of Oman. 2Department of Gastroenterology, Royal Hospital, PO Box 1331, Seeb 111, Muscat, Sultanate of Oman. 3Sr. Consultant and Head, Department of Chemical Pathology, Royal Hospital, PO Box 1331, Seeb 111, Muscat, Sultanate of Oman. *Address correspondence and reprints request to: Waad-Allah S. Mula-Abed, Sr. Consultant and Head, Department of Chemical Pathology, Royal Hospital, PO Box 1331, Seeb 111, Muscat, Sultanate of Oman. Objectives: The prevalence of coeliac disease in Oman is unknown. We aim to estimate the prevalence of coeliac disease in at-risk subjects, describe the clinical characteristics and laboratory findings associated with coeliac disease and the validity of serological testing for coeliac disease at the Royal Hospital, Oman over a period of three years. Methods: This is a retrospective case finding study. The medical and laboratory records were reviewed for patients for whom serum antiendomysium IgA antibodies were requested at the Royal Hospital during a 3-year period (1st Jan 2006-31st Dec 2008). The data were extracted in order to assess the following: a) Prevalence rate of coeliac disease among at-risk subjects; b) Clinical characteristics in patients with coeliac disease and clinical manifestations for which the requesting clinicians considered coeliac disease as a possible diagnosis, including their specialties; c) Laboratory tests results in patients with coeliac disease; and d) Validity of antiendomysium antibodies testing in comparison with histopathology of jejunal biopsies for diagnosing coeliac disease. Results: The study included 431 patients (250 females, 181 males) who were suspected of having (or screened for) coeliac disease. The median of age was 15 years (range: 9 months-74 years) with mean ± SD 18.95 ± 14.1 years. Of these, 15 (3.5%) patients (10 females, 5 males) with a median age of 19 years and mean 21.4 ± 13.0 years (range: 2.5-38 years), had positive antiendomysium antibodies results with median (range) of 160 (40-320) IU/L and mean± SD 204.5 ± 160 IU/L. Of these 15 patients, 13 had positive jejunal histopathological changes indicative of coeliac disease; the remaining 2 patients had no biopsy examination. Of the 44 patients with negative antiendomysium antibodies <10 IU/L who had jejunal biopsy, 41 were negative and 3 had histopathological changes suggestive of mild coeliac disease. All the 3 patients had serum total IgA levels within the reference range. The calculated validity indicators for antiendomysium antibodies were: sensitivity 81.3%, specificity 100%, positive predictive value 100%, negative predictive value 93.2% and efficiency 94.7%. The most common mode of presentation in patients with coeliac disease was gastrointestinal features, type 1 diabetes mellitus, anemia, short stature and hypothyroidism. The seropositivity in tye 1 diabetics was 4.9%. Investigations for coeliac disease were most frequently made by endocrinologists (pediatric and adult) who accounted for 53.8% followed by gastroenterologists (pediatric and adult) with 40.6% with less consideration by the other clinicians (5.6%). Conclusion: The availability of highly specific and sensitive serological test and increased awareness for coeliac disease among some medical specialties has increased the number of diagnosed cases of coeliac disease. The requesting for serological test is being made mainly by endocrinologists and gastroenterologists. Keywords: Coeliac disease; Antiendomysium antibodies; Prevalence; Oman. Department of Biochemistry and Biophysics, Metabolic Disorders Research Center, Gorgan Faculty of Medicine, Golestan University of Medical Sciences, Gorgan, Golestan province, Iran. *Address correspondence and reprint request to: Abdoljalal Marjani, Department of Biochemistry and Biophysics, Metabolic Disorders Research Center, Gorgan Faculty of Medicine, Golestan University of Medical Sciences, Gorgan, Golestan province, Iran. Objective: Different findings indicate that CYP2C plays a clinical role in determining interindividual and interethnic differences in drug effectiveness. The ethnic differences in the frequency of CYP2C19 mutant alleles continue to be a significant study topic. The aim of the present study was to assess the frequency of allelic variants of CYP2C19 in Turkman ethnic groups and compare them with the frequencies in other ethnic populations. Results: The allele frequency of CYP2C19*1, CYP2C19*2 and CYP2C19*3 were 56.43%, 23.57% and 20%, respectively. The result also showed that 39.7% of subjects expressed the CYP2C19*1/*1 genotype. While 42.1%, 9.3%, 9.3% and 1.4% expressed CYP2C19*1/*2, CYP2C19*1/*3, CYP2C19*2/*2 and CYP2C19*3/*3 genotypes, respectively. The genotype CYP2C19*2/*3 was not expressed in this study population. The findings suggested that 10% of subjects were poor metabolizers by expressing CYP2C19*2/*2 and CYP2C19*3/*3 genotypes. Fifty one percent of subjects were intermediate metabolizers having CYP2C19*1/*2, CYP2C19*2/*3 and CYP2C19*1/*3 genotypes and 37.86% were found to be extensive metabolizers expressing CYP2C19*1/*1 genotype. The frequency of intermediate metabolizers genotype was high (51%) in Turkman ethnic groups. Conclusion: This study showed that the determined allelic variants of CYP2C19 (CYP2C19*2 and CYP2C19*3 mutations) in Turkman ethnic group are comparable to other populations. These findings could be useful for the clinicians in different country to determine optimal dosage and effectiveness of drugs metabolized by this polymorphic enzyme. Keywords: CYP2C19 genetic polymorphism; Iranian Turkman ethnic group; polymerase chain reaction–restriction fragment length polymorphism (PCR-RFLP). 1Assistant professor of psychiatry, Research Center of Psychiatry, Golestan University of Medical Sciences, Golestan, Iran. 2PhD of Reproductive Health, Sabzevar University of Medical Sciences, Sabzevar, Iran. 3Associate professor, PhD of Epidemiology, School of Medicine, Shahroud University of Medical Sciences, Shahroud, Iran. 4MSc of Epidemiology, Center for Health Related Social & Behavioral Sciences Research, Shahroud University of Medical Sciences, Shahroud, Iran. *Address correspondence and reprints request to: Forough Mortazavi, PhD of Reproductive Health, Sabzevar University of Medical Sciences, Sabzevar, Iran. Objective: Cesarean rates in recent decades have been increasing and a number of studies have shown that cesarean increases maternal morbidities. The aim of this study is to compare the quality of life after cesarean and vaginal delivery. Methods: This prospective study was carried out on 356 pregnant women visiting urban health centers in Shahroud City, Northeast Iran, in 2011. The subjects completed the quality of life questionnaire in the third trimester of pregnancy and at 8 weeks postpartum. Results: In primiparas, the mean global QOL scores for the cesarean and vaginal delivery groups were 67.65 ± 12.7 and 72.12 ± 11.8, respectively. Also, the scores for the physical, psychological and social domains of QOL as well as the global score of QOL were higher in the vaginal delivery group than the cesarean group (p<0.05). In the case of primiparas, multiple regression analysis revealed that after adjusting for education, desirability of pregnancy and the General Health Questionnaire score, the delivery type remained as a predictor of the scores for the physical (R2=1.7%; B=-3.826; p=0.031; CI [-7.301, -.350]) and social (R2=2.5%; B=-5.708; p=0.017; CI [-10.392, -1.023]) domains of QOL and the global QOL score (R2=2.6%; B=-4.065; p=0.006; CI [-6.964, -1.164]). While multiparas, there was no relationship between QOL and type of delivery. Conclusion: In this sample of low-risk women, cesarean negatively affected the QOL of primiparas. More studies with larger sample sizes should be conducted to examine the effects of cesarean on QOL in both primiparas and multiparas within a shorter period after delivery. Keywords: Quality of Life; Cesarean; Pregnant women; Postpartum period. Urology Division, Department of Surgery, Sultan Qaboos University Hospital, Sultanate of Oman. *Address correspondence and reprints request to: Mohammed S. Al-Marhoon, Urology Division, Department of Surgery, Sultan Qaboos University Hospital, Sultanate of Oman. Results: Of the 225 initial consecutive patients who underwent extracorporeal shock wave lithotripsy, 192 (85%) had renal stones and 33 (15%) had ureteric stones. The mean±SD stone size was 11.3 ± 4.5 mm, while the mean age of the patients was 39.9 ± 12.8 years with 68.5% males. The mean renal stone size was 11.6 ± 4.7 mm; a mean of 1.3 sessions was required. The mean ureteric stone size was 9.9 ± 3 mm; and a mean of 1.3 sessions was required. Treatment success (defined as complete clearance of ureteric stones, stone-free or clinically insignificant residual fragments of <4 mm for renal stones) was 74% for renal stones and 88% for ureteric stones. Additional extracorporeal shock wave lithotripsy and ureteroscopy were the most adjunctive procedures used for stone clearance. Complications occurred in 74 patients (38.5%) with renal stones and 13 patients (39.4%) with uretetric stones. The most common complication was loin pain (experienced by 16.7% with renal stones and 21% with ureteric stones). Severe renal colic mandating admission occurred in 2% of patients with renal stones and 6% of patients with ureteric stones. In patients with renal stone, steinstrasse occurred in 3.6% and infection post extracorporeal shock wave lithotripsy in 0.5%. Using Multivariate Logistic Regression analysis, factors found to have significant effect on complete stone clearance were serum creatinine (p=0.004) and the number of shockwaves (p=0.021). Keywords: Extracorporeal shock-wave lithotripsy (ESWL); Kidney; Ureter; Stones. 1Gastroenterology Unit, Department of Child Health, Sultan Qaboos University Hospital, Muscat, PC 123, Sultanate of Oman. 2Department of Pharmacology and Clinical Pharmacy, College of Medicine and Health Sciences, Sultan Qaboos University, Muscat, Sultanate of Oman. 3Gastroenterology Unit, Department of Internal Medicine, Armed Forces Hospital, Muscat, Sultanate of Oman. *Address correspondence and reprints request to: Siham Al-Sinani, Gastroenterology Unit, Department of Child Health, Sultan Qaboos University Hospital, Muscat, PC 123, Sultanate of Oman. Objective: Published studies on the prevalence of celiac disease in type 1 diabetes mellitus from the Arab World are scant. We aim to report the prevalence of celiac disease in Omani children with type 1 diabetes mellitus. 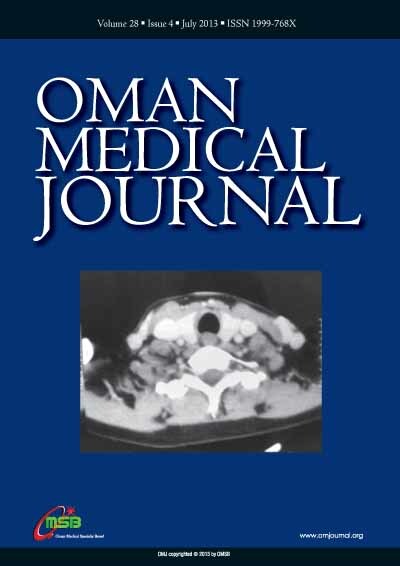 Methods: Children with type 1 diabetes mellitus were prospectively screened for celiac disease, at Sultan Qaboos University Hospital, Muscat, Oman over a period of one year (June 2011 - May 2012). Serum anti tissue transglutaminase IgA, endomysial IgA antibodies and total IgA were measured for screening of celiac disease. Children with positive anti-tissue transglutaminase and/or endomysial IgA antibodies underwent endoscopy. Results: A total of 103 children with type 1 diabetes mellitus were initially included. Ten patients were lost to follow up. Ninety-three patients aged 2-17 years underwent screening for celiac disease. Sixteen patients had positive anti-tissue transglutaminase (17%). Fourteen patients underwent endoscopy with duodenal biopsies, while two were lost to follow-up. Five patients with positive anti-tissue transglutaminase had intestinal biopsy proven celiac disease. The prevalence of celiac disease is 5.5% in our cohort of children and adolescents with type 1 diabetes mellitus. Conclusions: The prevalence of celiac disease in Omani children and adolescents with type 1 diabetes mellitus is similar to the World’s reported prevalence, but is less than that reported for Middle Eastern Arab children. To our knowledge, this is the first reported study on the prevalence of celiac disease in Omani children with type 1 diabetes mellitus. Keywords: Celiac Disease; Type 1 Diabetes Mellitus; Anti-tissue transglutaminase; Oman. 1Department of Microbiology and Immunology, Medical School, Rafsanjan University of Medical Sciences, Rafsanjan, Iran; Molecular Medicine Research Center, Rafsanjan University of Medical Sciences, Rafsanjan, Iran; Department of Microbiology and Immunology, Medical School, Kerman University of Medical Sciences, Kerman, Iran. 2Department of Microbiology and Immunology, Medical School, Kerman University of Medical Sciences, Kerman, Iran. 3Department of Microbiology and Immunology, Medical School, Rafsanjan University of Medical Sciences, Rafsanjan, Iran. 4Pharmacology School, Shiraz University of Medical Sciences, Shiraz, Iran. *Address correspondence and reprints request to: Abdollah Jafarzadeh, Department of Microbiology and Immunology, Medical School, Rafsanjan University of Medical Sciences, Rafsanjan, Iran; Molecular Medicine Research Center, Rafsanjan University of Medical Sciences, Rafsanjan, Iran; Department of Microbiology and Immunology, Medical School, Kerman University of Medical Sciences, Kerman, Iran. Objectives: H. pylori infection has been associated with some autoimmune disorders. The aim of this study was to evaluate the serum concentrations of rheumatoid factor and anti-nuclear antibodies in H. pylori-infected peptic ulcer patients, H. pylori-infected asymptomatic carriers and a healthy control group. Methods: A Total of 100 H. pylori-infected peptic ulcer patients, 65 asymptomatic carriers and 30 healthy H. pylori-negative subjects (as a control group) were enrolled into study. Serum samples of participants tested for the levels of rheumatoid factor and anti-nuclear antibodies by use of ELISA. Results: The mean serum levels of rheumatoid factor and anti-nuclear antibodies in peptic ulcer group was significantly higher in comparison to the control group (p<0.05). Although, the mean serum levels of rheumatoid factor and anti-nuclear antibodies in the asymptomatic carriers group was higher than those in the control group, the difference was not statistically significant. No significant differences were observed between peptic ulcer patients and asymptomatic carriers groups regarding the mean serum levels of rheumatoid factor and anti-nuclear antibodies. The mean serum levels of rheumatoid factor in men with peptic ulcer was significantly higher compared to the group of healthy men (p<0.05). Although in female of peptic ulcer patients or asymptomatic carriers groups, the mean serum levels of rheumatoid factor was higher than that in healthy women, but the differences were not statistically significant. Also, no significant differences were observed between men and women with peptic ulcer, asymptomatic carriers control groups based on the serum levels of anti-nuclear antibodies. Conclusion: The results showed higher serum levels of rheumatoid factor and anti-nuclear antibodies in H. pylori-infected patients with peptic ulcer disease which represent the H. pylori-related immune disturbance in these patients. Additional follow-up studies are necessary to clarify the clinical significance of these autoantibodies in patients with H. pylori infection. Keywords: Helicobacter pylori; Peptic ulcer; Rheumatoid factor; Anti-nuclear antibody. Section of Medical Oncology, Department of Internal Medicine, National Kidney and Transplant Institute- Cancer Unit, Quezon City, Philippines. *Address correspondence and reprints request to: Nunilon Vergara, Section of Medical Oncology, Department of Internal Medicine, National Kidney and Transplant Institute- Cancer Unit, Quezon City, Philippines. Objectives: Malnutrition is prevalent among cancer patients, and maybe correlated with altered quality of life. The objective of this study is to determine whether quality of life among cancer patients on chemotherapy at the National Kidney and Transplant Institute- Cancer Unit differs from patients with normal nutrition based on the Subjective Global Assessment scale. Methods: A cross sectional study was conducted among cancer patients admitted for chemotherapy at the National Kidney and Transplant Institute-Cancer Unit from January to May 2011. Demographic profile, performance status by Eastern Cooperative Oncology Group performance scale, nutritional status assessment by Subjective Global Assessment, and quality of life assessment by the European Organization for Research and Treatment of Cancer QoL-30 core module were obtained. Descriptive statistics and ANOVA were performed for analysis of quality of life parameters and nutritional status. Results: A total of 97 subjects were included in this study, 66 subjects (68.04%) were females and 31 (31.96%) were males. Mean age was 54.55 ± 11.14 years, while mean performance status by the Eastern Cooperative Oncology Group classification was 0.88 ± 0.83 with a range of 0-3. According to the Subjective Global Assessment, there were 58 patients with SGA A, classified to have adequate nutrition, and 39 patients (40.21%) were considered malnourished. Among these 39 patients, 32 were classified SGA-B (moderately malnourished) and 7 were classified SGA C (severely malnourished) mean global quality of life was 68.73 ± 19.05. Results from ANOVA test revealed that patients were statistically different across the Subjective Global Assessment groups according to global quality of life (p<0.001), physical (p<0.001), role (p<0.001), emotional (p<0.001), and cognitive functioning (p<0.001); fatigue (p<0.001), nausea and vomiting (p<0.001), pain (p<0.001), insomnia (p<0.001), and appetite loss (p<0.001). Conclusion: Global quality of life and its parameters: physical state, role, emotional state, cognitive functioning, cancer fatigue, nausea and vomiting, pain, insomnia, and loss of appetite were statistically different across all Subjective Global Assessment groups. Moreover, there was no difference between financial difficulties, social functioning, constipation and diarrhea among the Subjective Global Assessment groups. Keywords: Cancer nutrition; Quality of life; Subjective global assessment. 1MBBCh, ABMS-Pediatric, Pediatric Rheumatologist, Salmaniya Medical Complex, Kingdom of Bahrain. 2MBBCh, DCH (I), ABMS-Pediatric, Pediatric Nephrologist,Salmaniya Medical Complex, Kingdom of Bahrain. *Address correspondence and reprints request to: Zakiya Saleh Adnan Al Mosawi, MBBCh, ABMS-Pediatric, Pediatric Rheumatologist, Salmaniya Medical Complex, Kingdom of Bahrain. Hypocomplementemic urticarial vasculitis syndrome is an immune complex-mediated disease of unknown etiology. The clinical course is characterized by urticaria, conjunctivitis, joint pain, and hypocomplementemia. We here report a case of a child with hypocomplementemic urticarial vasculitis syndrome that progressed to nephritis. Renal biopsy was consistent with diffuse proliferative glomerulonephritis with diffuse subendothelial immune deposits. He responded well to a combination of steroid and mofetil micofenolate. 1Assistant Professor, Department of Orthopedics, Subharti Medical College NH-58, Delhi Haridwar Byepass, Subhartipuram, Meerut-250002, UP, India. 2Associate Professor, Department of Orthopedics, Subharti Medical College NH-58, Delhi Haridwar Byepass, Subhartipuram, Meerut-250002, UP, India. 3Associate Professor, Department of Skin and V.D., Subharti Medical College, Meerut-250002, UP, India. 4Resident, Department of Skin and V.D., Subharti Medical College, Meerut-250002, UP, India. *Address correspondence and reprints request to: Shivam Sinha, Assistant Professor, Department of Orthopedics, Subharti Medical College NH-58, Delhi Haridwar Byepass, Subhartipuram, Meerut-250002, UP, India. Among the inherited bone marrow failure disorders, dyskeratosis congenita is an X-linked inherited disorder arising as a consequence of short telomere and mutations in telomere biology. Production of the altered protein dyskerin, leads to vulnerable skin, nails, and teeth which lead to higher permeability for noxious agents which can induce carcinogenesis accounting for the classical triad of skin pigmentation, nail dystrophy and oral leukoplakia. This condition is fatal and patients succumb to aplastic anemia, malignancy or immunocompromised state. We present a young male with the classic clinical triad and avascular necrosis of both femoral heads, with no evidence of hematologic anomaly or any malignancy. He was managed for osteonecrosis with uncemented total hip arthroplasty for the symptomatic left hip. Our case represents a benign form of such a fatal and rare condition, which if detected and managed early can result in improved quality of life for the patient suffering from this disorder. This patient is under our meticulous follow-up for the last 2 years in order to determine any late development of complications before being labelled as a variant of this syndrome. Keywords: Dyskeratosis congenita; Osteonecrosis; Leukoplakia; Dyskerin; Inherited bone marrow failure syndrome. Department of Obstetrics and Gynecology, Royal Medical Services, King Hussein Medical Center, Amman-Jordan. *Address correspondence and reprints request to: Nidal Al-Ibrahim, Department of Obstetrics and Gynecology, Royal Medical Services, King Hussein Medical Center, Amman-Jordan. Cornual ectopic pregnancy is a rare form of ectopic pregnancy but has catastrophic presentation when diagnosis is missed. It is usually misdiagnosed as degenerated myoma at uterine fundus but can be differentiated by positive pregnancy test, absence of intrauterine gestational sac and diagnostic laparoscopy when necessary. In this case, we present a case of cornual ectopic pregnancy diagnosed by serial serum beta subunit of human chorionic gonadotropin, vaginal ultrasound and diagnostic laparoscopy, which was managed by evacuation of the cornual ectopic by laparotomy, excision of the tube and then suturing the pedicle adjacent to the uterine wall. Keywords: Beta subunit of human chorionic gonadotropin; Cornual ectopic pregnancy; Vaginal ultrasound. 1OMSB Resident, R3, Royal Hospital, PO Box 262, Muscat 132, Sultante of Oman. 2Sr. Consultant, Department of Infectious Diseases, Royal Hospital, PO Box 262, Muscat 132, Sultante of Oman. *Address correspondence and reprints request to: Khawla Said Al Shidhani, OMSB Resident, R3, Royal Hospital, PO Box 262, Muscat 132, Sultante of Oman. Subcutaneous fat necrosis of newborn is a form of panniculitis that often occurs in term and post-term neonate with predisposing risk factors such as perinatal asphyxia and maternal gestational diabetes. A cutaneous involvement may be associated with metabolic complications such as hypoglycemia, hypercalcemia and hypertriglyceridemia. Here, we present a case of Subcutaneous fat necrosis of newborn with bilateral symmetrical involvement of both axillas in a perinatal asphyxiated newborn that has not been previously described in the literature. In this case, there were no major complications apart from asymptomatic hypercalcemia. Keywords: Subcutaneous fat necrosis; Neonate; Hypercalcemia. Department of Radiotherapy, Institute of Postgraduate Medical Education and Research, 242, AJC Bose Raod, Kolkata, 700020, West Bengal, India. *Address correspondence and reprints request to: Ratan Sarkar, Department of Radiotherapy, Institute of Postgraduate Medical Education and Research, 242, AJC Bose Raod, Kolkata, 700020, West Bengal, India. Follicular dendritic cell sarcoma arises from the follicular dendritic cells present in the lymph nodes, especially of the head and neck area. Rarely, extranodal sites may be affected including tonsil, the oral cavity, liver, spleen and the gastrointestinal tract. Here, we report a case of intra-abdominal follicular dendritic cell sarcoma presenting as a huge mass in the ileocecal region of a 24-year young woman. Keywords: Follicular dendritic cell sarcoma; Ileocecal; Extranodal. Leadership of Healthcare Professionals: Where Do We Stand? 1Professor, Department of Pathology, Padmashree Dr.D.Y.Patil Medical College, Hospital and Research Center, Dr. D.Y. Patil Vidyapeeth, Pimpri, Pune 411018, Maharashtra, India. (Formerly Asso. Prof. Pathology, PAP Rashida Institute of Health Sciences, Universiti Brunei Darussalam). 2Medical Student, PAP Rashida Institute of Health Sciences, Universiti Brunei Darussalam, Jalan Tungku link, Gadong BE 1410, Negara Brunei Darussalam. *Address correspondence and reprints request to: Sunita Bamanikar, Professor, Department of Pathology, Padmashree Dr.D.Y.Patil Medical College, Hospital and Research Center, Dr. D.Y. Patil Vidyapeeth, Pimpri, Pune 411018, Maharashtra, India. (Formerly Asso. Prof. Pathology, PAP Rashida Institute of Health Sciences, Universiti Brunei Darussalam). Objectives: Pregnant women are more susceptible to periodontal disease like gingivitis. Periodontal disease may be associated with adverse pregnancy outcomes. There is no published literature on dental health in pregnant women in Brunei, Darussalam. The objective of this study was to assess women’s knowledge and attitude towards oral and dental health during pregnancy and to examine their self-care practices in relation to oral and dental health. This study was carried out at the maternal child health clinic, Jubli Perak Sengkurong Health Centre, Brunei, Darussalam. Methods: This was a cross-sectional descriptive and analytical study conducted at the maternal child health center in Brunei, Darussalam. The study group was comprised of 95 pregnant women attending the MCH clinic, Jubli Perak Sengkurong Health Centre, September 2010, using convenience sampling method. A self-administered questionnaire was used, after it was pre-tested and validated. Statistical analysis was done using SPSS version16. Results: Of the total study group, 97.9% responded to the questionnaire and participated in the study. All the women brushed at least twice daily. However, only 40.9% flossed daily, 31.2% brushed after meals and 26.9% had a dental check-up at least twice a year. The knowledge related to dental care was also poor among the pregnant women. Though the majority of them (96.8%) agreed that women should have a dental check-up during pregnancy, only 55.9% actually practiced this. This raises serious concern since pregnant women may need extra oral and dental care due to susceptibility to gum diseases during pregnancy, which may contribute to low birth weight babies and premature births. Conclusion: This study highlights important gaps in dental knowledge and practices related to oral and dental healthcare among pregnant women in Brunei, Darussalam. More intense dental health education, including oral health promotion in maternal child health centers can lead to improved oral and dental health, and ultimately pregnancy outcomes. Keywords: Attitude; Dental health; Knowledge; Practice; Pregnant women. Vitamin D Deficiency and Systemic Lupus Erythematosus: Cause or Consequence?